On Sunday morning, I made my way to Saint Peter's not to attend Mass (we would do that later as a family), but to visit the various tombs of the Saints, Blesseds and soon to be (think Pope John Paul II), praying the Office at the various altars and then the rosary. It is interesting to me that yesterday morning I awoke in the middle fo the night and watched a live Mass from the St. Peter's and it looked so different to me that at first I thought the Pope was at some other church (this is just the opposite of what I expected would be the case from here on), but I think when you only see a small image of something that is so massive it has that effect. These early morning mini-pilgrimages had become a good way to begin the day and to keep the focus on Christ. In some way my infant son had set the tone on the very first visit to St. Peter's a week earlier when the two of us (he on my back in a baby carrier) had ducked into the Blessed Sacrament chapel and knelt in a back pew and he had spoken one word, "Christ." 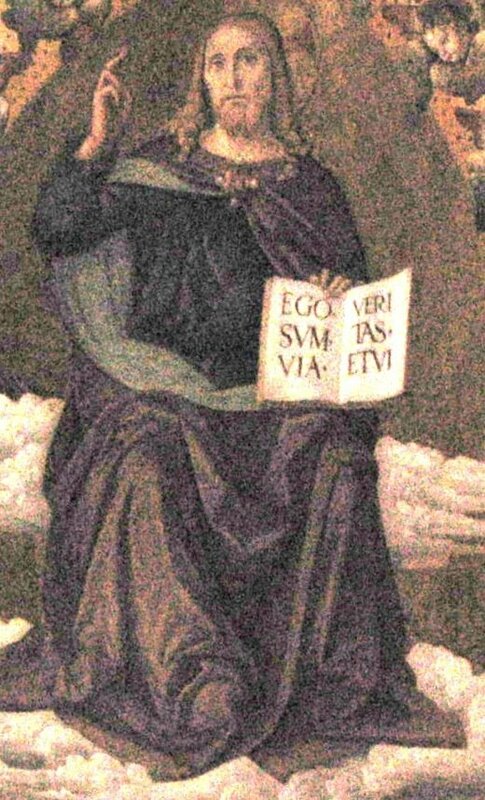 Like the children that St. Augustine heard saying "Tolle et lege," his simple "Christ" echoed in my ears as the proclamations of St. Peter inscripted in Latin and Greek on along the walls of St. Peter's visually confirmed the basis of the epicenter of the Church that Christ founded on Peter after he proclaimed with Divine insight "You are the Christ, the Son of the Living God." The bodies of incorrupt popes, that dot St. Peter's point to the awaiting of the resurrection but also speak of the sleep that all followers of Christ long to be awakened from--just as the oversized cross of St. Helena, spear of St. Longius, cloth of St. Veronica and cross of St. Andrew all hover toward the the altar where the pope alone says Mass--amidst the glory of the papacy, I doubt anyone serving in that office could not be reminded everytime that they mount that sanctuary that "here we have no lasting kingdom." One morning remained on this trip to make this morning visit, it would be a hasty one due to our morning departure. Making my way back to the apartment, everyone was beginning to pack what wasn't needed beyond today and there was a large bag of garbage needing removal (it is amazing how much garbage we Americans can produce on a continuous basis--of course having a baby in diapers produces its own gross--in every sense of the word). Everyone gathered what they would need and we headed the several blocks back to St. Peter's this time to the long line that circled the piazza to go through security. The church was filled with tourists, mass goers and seekers as well as the ever present saints, angels and monuments of popes. Once we made it clear that our intention was to attend Mass we were allowed into that area, taking seats right below St. Helena holding the cross, near where the relics of the cross are kept, over which angels hold the sign of the cross with a sign proclaiming "by this sign conquer" that led to Constantine's conversion--this image framed with columns that are from the original Temple of Solomon in Jerusalem--heady stuff and the foder for much meditation. 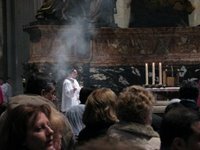 The Mass, celebrated in Latin was the same Mass that you attended that Sunday in whatever language you heard it in--certian parts stood out to me, because I have been studying the differences between the Latin and the English translation that we hear every time we go to Mass. In this mass of people from every continent and who spoke every language the Latin provided a common language (for this reason I applaud Benedict's decision to include the basic Latin prayers in the Compendium of the Catechism and hope that religious educators will make an effort to teach them). At Communion, the barriers around the high altar were opened up and we received Communion from one of the Canons of St. Peter's. I still marvel at the lack of order or even the thought that maybe their is an orderly way of doing this. At the conclusion of Mass we made our way with the throng out into St. Peter's square for the Sunday Angelus (our second on this trip). 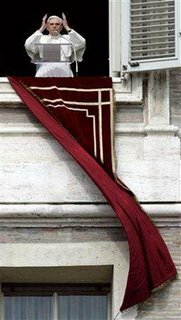 The wind was blowing the banner hanging from the Pope's study pretty steadily. At noon the cannon on the nearby hill went off (this happens everyday at noon) and a second later the Pope appeared at the window. I'm going to use some Yahoo photos of this event from that particular day. 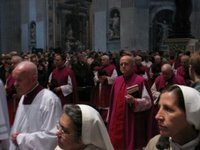 When he speaks, as I've mentioned in another post, his voice fills the piazza leading Joseph to conclude that the Pope is a loud talker, "He has a big voice," I believe were his exact words. To all the English-speaking pilgrims and visitors I extend a warm welcome. In a special way I greet the students from Trondheim Katedralskole in Norway and those from Duquesne University in the United States. As we begin this holy season of Lent, I pray that Almighty God will continue to bless the members of your communities with a vigorous faith and a generous spirit. Upon all of you, I invoke the abundant Blessings of Almighty God. I wish you all a good Sunday and a good Lent! We then made our way to the ever present taxi's nearby and inquired about the price of having one of them take us to the airport in the morning. Someone was found who was available and he agreed to pick us up at our apartment in the morning and to take us to the airport for about 5 euro less then we had paid to get to the apartment. We then stopped to eat at a place very close to our apartment and had an okay meal. Amy went to the apartment and ran into the Roamin Roman who talked with her for a bit and told her that we must visit Santa Croce in Gerusalemme, I was more than happy to hear this as this was a Church that we hadn't visited yet and I wanted to see the Titulus that I had read might very well be the actual sign that hung over the cross because it didn't have the accuracy with the Gospels that one would expect a forgery to have. So as soon as lunch was over, we loaded up for the trip and set out without Katie who had reached her limit of force marches (she stayed behind and slept). We took a cab to go directly to Santa Croce in Gerusalemme. Taking a cab is a quick way to get there, but with few exceptions, once you get there trying to find a cab that will take you back was more of a challenge. Anyway, we got there and went in and began our look around. This is a church that could be said that St. Helena brought back with her...soil from the Holy Land was laid at the base of the church and some is visible under a glass, where for some reason people like to squeeze money to obscure the soil...which if not removed will one day become one with the soil. The relics are not in the main church but in a seperate chapel through which a Cistercian monk who I asked to bless Michael and Joseph gave us a tour. He told us that Joseph was his baptismal name, but now in religion he was known as Michael...a happy coincidence. Two thorns from the crown of thorns. The plant they come from has not been identified. They agree with other thorn relics. 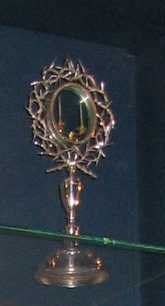 The 'Titulus', part of the Title of the Cross bearing the words "Jesus of Nazareth, King...". It was found on 1 February 1492, built into the wall of the basilica behind a mosaic that was being repaired. The brick which covered it was inscribed 'TITULUS CRUCIS' - it can be seen in the outer relic chapel, together with a reconstruction of the whole Title. 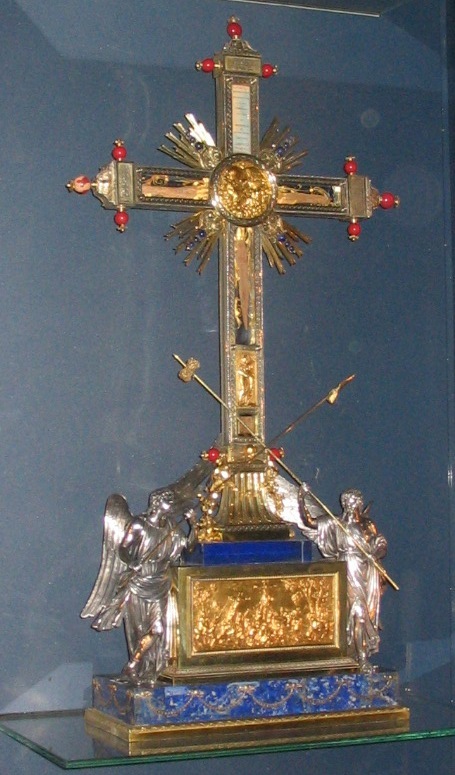 The relic was unknown at the time, but there are sources indicating that such a relic was venerated in the courtyard on Calvary in Jerusalem. The pilgim Aetheria (c. 385) mentions this, as does the pilgrim Antonius of Piacenza two centuries later. 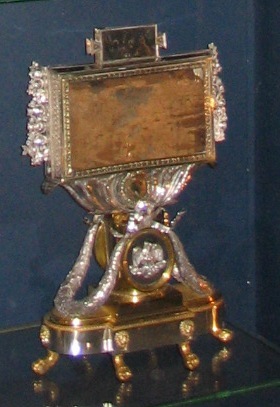 St Helena is said to have divided the relic into three parts, giving one to Constantine, keeping one in Jerusalem and sending the last to Rome. The relic was allegedly hidden in the wall c. 455, when the clergy needed to protect it from the attacking Visigoths. It is unknown why it was left there, and forgotten, until 1492, but it might simply be because the cleric responsible for hiding it was killed or displaced during the sack of the city. The workmen found a lead coffer sealed by Cardinal Gerardus, later Pope Lucius II. It is said to have been in quite good condition at the time, but Bosio wrote 60 or 70 years later that the red paint on the letters had faded and that worms had eaten away the words 'Jesus' and 'Judaeorum'. The words are cut from the right to the left, leading some scholars to believe they were cut by a Hebrew used to writing in that direction. It does seem unlikely that a medieval forger would do such a thing. Splinters of the True Cross. 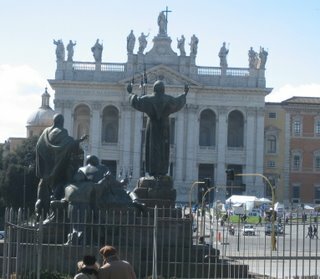 The finger of St. Thomas (the Churches in Rome site doesn't mention this but Father Michael did, saying that it was the index finger of St. Thomas that would have touched the wounds of Christ). Leaving the Church of the Holy Cross in Jerusalem, we took out the ever used maps of Rome and discerned the direction of St. John Lateran's where we also knew we could catch the Metro train back toward the Trevi Fountain and another destination for this final day in Rome, the tomb of St. Gaspar del Bufalo ( a Saint that I had been telling Joseph was the real Superman...and when we returned from Rome we found the book that details the saints life, complete with illustrations one of which has a bandit shooting his gun at St. Gaspar and the bullets falling to the floor!). 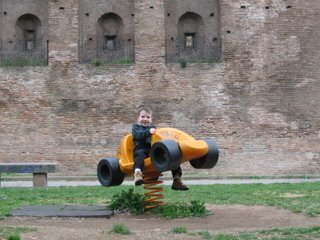 There was a park along our path with some children's rides and we stopped to allow Joseph to ride one (the plastic and the massive city wall behind is a nice contrast between ancient and modern I think). In the bowels of the Metro station we bought a Metro pass (our week passes had expired the previous evening)and boarded the train heading for the Trevi Fountain for St. Gaspar's tomb. When we arrived at the Trevi, it was crowded and there was a church there that we went within. It was Santi Vincenzo e Anastasio,what I witnessed but didn't know at the time was the "hearts and viscera" of more than 22 popes...hmmm, but this wasn't the church of St. Gaspar. Walking out I asked two Italian police (one male, one female) in non intelligible Italian where St. Gaspar del Bufalo might be? They both shook their heads. 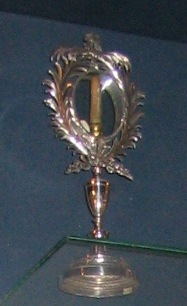 "Santa Maria in Trivio"? Again, they had no idea, but pointed me the opposite direction of where the Church actually was, but this gave me the opportunity to see where several priests I know live in Rome and Santa Casa Maria at the old North American College. Then taking a left we passed another church which I we also stepped into, still no St. Gaspar, then took another left and we were back at the Trevi. And there to the left was Santa Maria in Trivio and here the resting place of St. Gaspar in a bronze likeness that held its hand out so if you were kneeling you could grasp the hand of Gaspar as you prayed. I came late to even knowing St. Gaspar discovering him one day when traveling through Ohio and coming across the old Precious Blood Seminary that now serves as a retirement home for the Precious Blood priests and brothers. There is a relic of St. Gaspar's leg there and on a number of occaisions I have experienced the powerful intercession of St. Gaspar. It is interesting to note and there were holy cards at Gaspar's tomb that just before the start of the Second Vatican Council that Blessed Pope John XXIII came here to this Church and the tomb of St. Gaspar to pray for the success of the Council. A fitting Church to put the cap on our pilgrimage (although I would still return to two others before leaving Rome). We all knelt before St. Gaspar and offered private intentions and thanksgiving. Then rewarded Joseph with a trip to Burger King (might he have prayed to St. Gaspar for this treat? )before catching a bus that took us back to St. Peter's. It was evening and we all set out for last minute souvenir shopping as well as a more practical concern of getting enough euro to pay the cab driver in the morning (this brought on some panic because the usual ATM's I used all weren't working for some reason). But first I went to Santa Maria in Traspontinawhere I prayed the Evening Office and Compline,saying the Salve Regina kneeling before the brilliant image of Our Lady of Mount Carmel. Evening came, the Ninth Day!